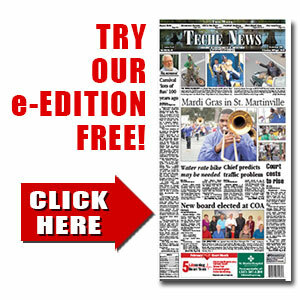 Patriots overwhelm The ’Ville | TecheToday.com | Teche News | St. Martinville, La. The Ellender Patriots used a big-play passing attack and a ball-hawking defensive secondary in rolling to a 41-27 victory over St. Martinville last Friday to disappoint a Tiger homecoming crowd. With quarterback Jared Davis absent from the team, sophomore Maravon Williams was victimized by the Patriots who picked off five of his 20 passes, returning one for 25 yards for a TD late in the third quarter that pretty much sealed the Ellender victory. The Patriots used a pari of quarterbacks effectively, with Danatravien Martin throwing for 151 yards and a touchdown while Colby Poe contributed two TDs and 156 yards on eight completions. The Tiger secondary had four picks of its own, but it wasn’t enough as the Patriots rolled up 331 yards through the air and another 103 on the ground for 437 net offense. The Tigers scored first after an exchange of interceptions. Javone Wiltz intercepted Martin at the Ellender 43 and three plays later Williams found Deantre James open for a 48-yard score. Dylan Wilmore’s PAT gave SM a 7-0 first quarter lead. But the Patriots struck for two quick TDs late in the half. After a 63-yard TD run by James was nullified by a holding penalty, Williams was picked off midway into the second period. It took the Patriots just two plays to reach the end zone, with Poe hitting Martin for a 29-yard strike. The two-point conversion try failed, leaving the score at 7-6. But a SM fumble put Ellender in business at midfield and the Patriots struck again on a 28-yard Martin-to-Arvic Rice TD pass. Martin added the two-point conversion to put Ellender up 14-7 with 3:09 left in the half. SM went three-and-out but sophomore Javone Wiltz intercepted Poe near midfield. Then the Tigers scored on a wild play. An Ellender defensive back intercepted Williams only to fumble the ball at the EHS 5-yard line. An alert Dylan Doucet scooped up the pigskin and dove into the end zone for a Tiger TD. A bad snap killed the PAT attempt to leave SM trailing at 14-13. Just before time expired SM’s Trevon Goings got his second interception but the Tigers didn’t have time to capitalize on the turnover. A hectic third quarter saw the Patriots strike for three touchdowns while the Tigers managed only one. Channing Holiday ran 6 yards to pay dirt midway through the period to stretch Ellender’s lead to 20-13 but SM answered with a 19-yard TD run by Williams to knot the score at 20-all. But that was pretty much The ’Ville’s last hurrah as Reginald Williams returned the ensuing kickoff 87 yards for a stunning touchdown. Then four plays later Patriot Steven Foret returned a Williams interception 25 yards for another Ellender score and the visitors took a 34-20 lead into the final stanza. SM managed to close the gap to 34-27 on a 6-yard run by Tra Benjamin but the Patriots sealed the victory with a 55-yard bomb from Martin to Reginald Williams at the two-minute mark. St. Martinville’s final offensive play was yet another Williams interceptions at midfield and the Patriots were able to run out the clock. Williams finished with 142 yards and a TD on nine completions out of 20 attempts. James had eight receptions for 97 yards and the TD. Benjamin led the SM ground game with 58 yards and a TD on 11 carries. The 3-2 Tigers open District 5-4A play by hosting parish rival Breaux Bridge (1-4) this Friday.